This is .308 ammo by Magtech is newly manufactured, non-corrosive, reloadable, brass cased, and boxer primed. Each round features a 150 grain full metal jacket boat tail projectile. FMJBT bullets ensure high accuracy and stable flight at long distances and is perfect for range training. This round has muzzle velocity of 2820 feet per second. Magtech has been manufacturing high quality ammunition since 1926 and currently manufactures ammo at its state-of-the-art facility in Sao Paulo, Brazil. Grab this bulk case of 1000 rounds today, and head out to the range! Quick shipping and excellent ammo. No problems feeding my AR-10 and Bushmaster .308. Great company to do business with. 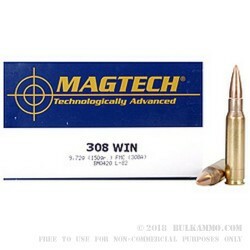 Magtech .308 ammo is probably the best "bang for your buck". I have shot 100's of rounds of Magtech .308 and never had a problem with it. It is accurate - not the best - but for the price you can't get any better. A: Hello Troy! 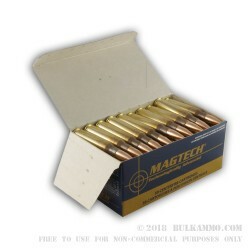 Magtech ammunition is loaded in boxer primed, brass cases that can be reloaded. A: Hello Charlie, These 150gr. 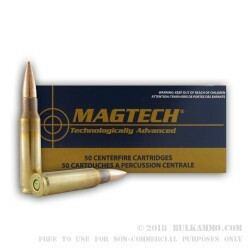 FMJ rounds by Magtech in .308 are non-magnetic. They have a lead core, copper jacket, and a brass case. You can safely shoot them at a range that does not allow magnetic rounds. Q: local range has non-magnetic requirement. Will this work? 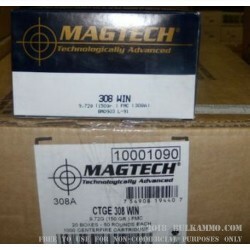 A: Magtech's 308 Win 150 gr FMJ (308A) ammo is non-magnetic and will comply with your range's regulations. Enjoy your next trip to the shooting range!